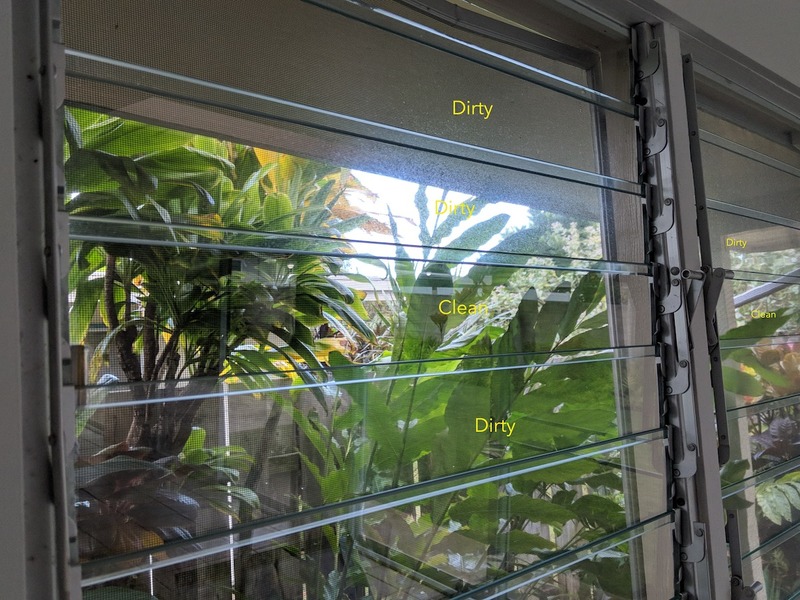 Different ways to clean Jalousie (louvered) windows. Louvered windows, or jalousies as they are called in Hawaii, are great for allowing the trade winds to blow through the house and cool it down with no energy costs, but they are also difficult to clean. Of course a clean and therefore practically invisible glass louvre looks a lot nicer than one with calcium deposits and haze all over it. But how do we best clean these windows, that we love so much until they are dirty. I set out to test as many methods as I could find and compare them for results and levels of difficulty. I should mention at this point that there are 458 panes of glass in all of my home’s jalousies. I started with the obvious. Blue liquid glass cleaner, most often found under the Windex brand. Windex Professional, which was very good, cannot be found anywhere these days, so regular Windex, that is sold almost everywhere, was the best we could find. Using a light spray, waiting a couple of seconds for it to work, then wiping it off with a clean microfiber towel, I found that the first one or two panes came out quite well, and then more and more haze was left behind as I worked my way from window pane to window pane. It quickly became apparent that I would need a new clean towel after 4 or 5 panes. I have 458 panes. This is not practical. It may be the worst method tried, except that I once tried a variation using newspaper to wipe the glass. That was the worst. At least microfiber towels do not leave you with piles of wet, shredded up newsprint. Why not go big? The advantage of hosing down the windows from the outside is, it is extremely fast, and you can wash the screens in place at the same time, (assuming you have the older type with the screen on the outside), along with the sills and siding. Enough water comes out of the hose to actually clean the glass without wiping or detergent. But once the wash down is over you are left with wet windows and of course the inside of the glass is not clean, and neither are the edges where the bottom of one closed pane tightly overlaps the one beneath it. Older jalousies also allow water to get through, which is actually very worrisome because it indicates what will happen when the big hurricane finally hits Hawaii. So you have to run inside after the hose down and clean up some mess with a towel. Anyway, after the wash, everything is wet, so you have to open the jalousies and wipe each pane top and bottom, thereby cleaning the inside of the glass. The screens will eventually dry themselves. While this washing method is fast, the follow up is hard work and takes quite a long time. Still, if everything needs a wash, not just the glass, the old garden hose with a gentle spray nozzle is a good way to go about window cleaning. This is a variant of the Windex we tried above. If the dirt is a bit on the greasy side for any reason, the foam sprays are a bit better than the blue liquid. But you still need an army of towels to go this way. I found this to be expensive and inefficient. Well, I have one, so I tried it. These is little to no advantage to pressure washing over a simple garden hose, and it is a lot of machine, power cord, water hose, and applicator line, to pull around the house. The pressure washer uses a fraction as much water, but it is actually slower as a result of that. And you still need that hose to feed the pressure washer. The hose on its own is easier. If you Google how to clean jalousies, you will find a heavily read page about how one guy recommends taking out each pane and giving it a bath in the tub. I found it takes a long time to remove and replace many panes, and there is quite a risk of breakage, which would be a huge inconvenience. I say it is better to take the water to the window, than to take the window to the water. Safer too. So what if you don’t bother to dry the windows? If there is no direct sunshine on the glass, and there shouldn’t be before you try any of these methods, then the glass will dry itself in almost any other weather. Unfortunately the results I got from this very wet towel method were haze and water spots. So major dust and dirt were mostly removed, but the windows were not clean and clear. Even when followed up with a squeegee, I was left with lines and smears. A jalousie window installer, when I asked him for the best way to clean them, told me that if you don’t let the windows get too dirty, a barely damp towel is a lot less work than a very damp or wet towel, or any of the aforementioned methods. He is right! But I always let my windows get too dirty before I am forced to clean them, so this takes a lot of towels. Still it is one of the best methods tried, and if you clean the windows more frequently than I do, it is great. There are few websites that recommend baby wipes for cleaning windows. The ingredients of baby wipes are good for keeping the baby’s bottom soft after repeated cleanings, but these same moisturizers leave haze on jalousies. if that was not bad enough, the disposable fabric wipes are not really very environmentally friendly, and it is also expensive to do a lousy job with these unsuitable wipes. We all know that professional window cleaners use a squeegee. They begin with a mild soapy water solution (or their proprietary variant) applied with a microfiber sleeved applicator, then they dry off the window with a skillful curved sweep of the squeegee. It is great for large expanses of glass, and I do this myself on the sliding doors that we also have in addition to all these jalousies. The panes of jalousies do not really lend themselves to this proven technique, because there are all the tops and all the bottoms, each of which is a very small window. This multiplies the work a great deal, and you also end up with wet parts at either end of each jalousie by beside the clip. So basically, the best widow washing method for non-jalousie windows, is pretty useless for jalousies. My article here may be the first to recommend using the same liquid that you pour into your car’s windshield washer reserve. This stuff costs less than Windex, less than liquid detergent, less than bottled water, and yet it is usually completely overlooked as a window cleaning product. When it comes to jalousies, this stuff performed better than any of the above methods. It is better than plain water, better than glass cleaner, better than glass foam and better than soapy water. Using the barely damp towel method, the results are a crystal clear invisible pane. Yes they are still jalousies, and I still have 458 of them to wipe, but the bug wash was the most effective, with the clearest results, the least mess and used the least amount of work, assuming the screens do not need washing. In conclusion, I will say that if only the glass panes need to be cleaned, always use the automotive bug wash with a microfiber towel, not too wet. But if the screens, frames, sills and siding are all dirty, then go with the hose down.